I started on this journey running long distance to prove to myself that since my body isn’t exactly cooperative in looking how I wish it would, I’d show myself that it can still do amazing things. I’ve had some amazing experiences with that journey and I’m glad that I have shown myself that I can set goals and I can accomplish them. I don’t know that I would have imagined myself enjoying physical fitness and having it become an important part of my everyday life. My injury and recovery has been a major setback in how I feel about myself and the way I look. I gained around 25 pounds. I’ve lost and gained 10 pounds a few times. I hate the number on the scale and my pants are a little snug lately. For some reason, I was doing much better with eating well at first than I have been eating lately. I hadn’t gained any weight until the first of this year. Then, it just piled on quickly and my confidence dropped. When the cast and boot went on and I was restricted from moving, I started to worry about whether I’d even be able to run my marathon this October. I have started training and easing back into running. I’ve been slower than I wish to be and I get tired much more quickly than I’d like to. It has had an effect on how confident I am in my ability to train for and complete my race. Last week, I went to the Gulf Coast in Alabama for vacation. This was not good for my ego as I saw women walking by in their swimwear confidently as I wished I could just hide a little more of my chest or that my shorts were a little longer to hide my fat legs. I have never loved my body. Even at a slim 150 pounds and 5′ 7″, I wore a size 11 and I felt chubby. *I’ll have to cover my female influences as I grew up in a blog post [and probably a therapy session] at some point. Let’s just say that I’ve been trying to diet as long as I remember. Tonight, I’m nervous that I need to train for a marathon and I’m not feeling the usual confidence that I have in the past. I want to run a marathon and I planned to last year. I don’t feel like I’m going to be capable of finishing. I am in a week where my long run should be 7 miles and I’ve run 4 miles at the most. I am lacking confidence and despite knowing that it is 100% something I need to change in my head, I wish I could change my body instead. I wish that it showed that I work hard to be this chubby woman and if I didn’t, I’d be larger. I wish I didn’t feel like crying when I see someone else having a good time in a 2 piece and not trying to cover herself or hide. I am pissed that I’m this person when I work so hard to be the person I feel like I should be. I wrote the above paragraphs, took a little break, and went to the store. I spent time thinking about what I’d written here. To some degree, I feel this is just a mood that I get into at times. I am truly envious of people who have a slender build and I often get caught up in the “why can’t I just,” attitude about my body. The cure for this would seem to be plastic surgery or taking more extreme measures to aggressively shape myself into the woman I want to be. It isn’t the solution, though. This is a psychological issue. This is hating my body for just being the way it is. This is something that people struggle with and rarely talk about. People will encourage by commenting on other redeemable qualities, but truly, what you need to know is that you’re being too critical of yourself and it is great to want to take care of your body and your health to be healthy. Not because you think it will change what you look like. That is something I need to work on changing from within myself. I’ll continue training to run 26.2 miles because I know my body is capable. I’ll find a swimsuit that covers more of my chest so I feel more comfortable and spend less time tugging at it and looking down at my body and more time enjoying the moment I’m in. I’ll realize that I can’t really know what’s going on in the heads of those women who seem so comfortable in their own skin as they walk by and that I can’t compare myself to them. Also, I don’t mention these things in front of my kids and I hope that I can one day carry myself in a way that they find admirable and they find confidence in themselves. Sorry that this one was kind of a downer. I plan to get out and run tomorrow as my schedule says. I figured out how to get intervals on my watch, so I’ll run/walk if needed. I am still fundraising. That’s another issue altogether with how hard I’ve been working on that. I’m $916 to my $2k goal. 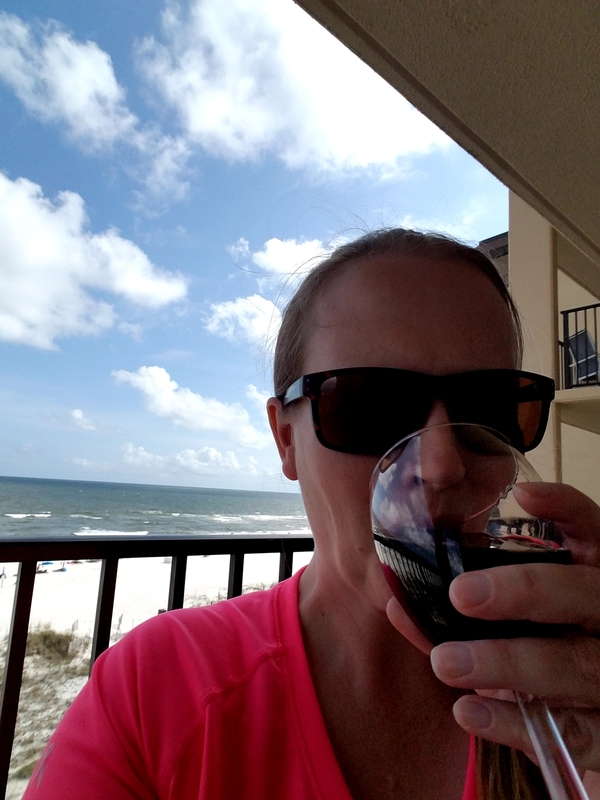 Here’s a pic of me drinking wine on the balcony while on vacation. The Gulf Coast is gorgeous. I had a great time and I think my kids really enjoyed themselves as well.